Doctor Who Timeless Trading Cards in Stores Now with the Most Comprehensive List of Autograph Signers Ever! Under license from BBC Worldwide North America, The Topps Company is thrilled to announce new Doctor Who Timeless trading cards are in stores now! With over 150 cards, the set features autographs from 78 iconic characters, with 47 first-timers. Among the new signers are Jenna Coleman, who played fan-favorite companion Clara Oswald in seasons seven through nine; John Hurt, who portrayed the War Doctor in the 50th Anniversary Special, “The Day of the Doctor”; Michelle Gomez and John Simm, who portrayed different incarnations of villain Missy/the Master; Arthur Darvill, who played companion Rory; and Ingrid Oliver, who portrayed Osgood. This is the most comprehensive trading card set dedicated to the historic television show released in the U.S. The set contains autographs from seven Doctors – David Tennant, John Hurt, Tom Baker, Peter Davison, Colin Baker, Sylvester McCoy, and Paul McGann – and fan favorite modern companions – Jenna Coleman, Billie Piper, Freeman Agyeman, Alex Kingston, Noel Clarke, Arthur Darvill, and John Barrowman – along with many classic companions. Each box contains two hits – an autograph, a costume card, or a medallion card. There are 100 base storyline cards that span the entire 50+ year series, 50 insert cards to collect, eight costume pieces from the show, 36 medallion cards and ultra-rare chase items including signed costumes, signed medallion cards, plus dual and triple autographs. Don’t miss out on the release of Topps Doctor Who Timeless trading cards. You can currently find them at local hobby shops, Topps.com, and Toys R Us. 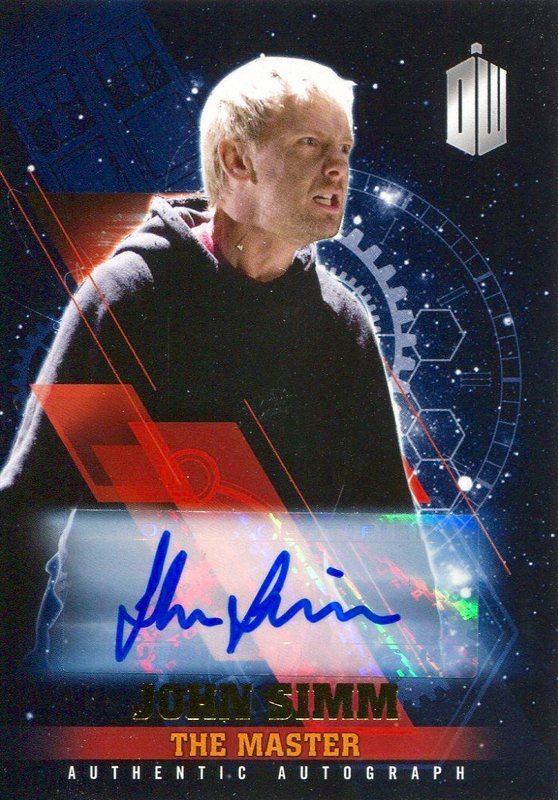 Tags: 2016, actor, autograph, card, ccg, collectible, Collectibles, doctor who, dr who, entertainment, game, john, memorabilia, non-sports, signer, simm, tcg, the master, timeless, topps, trading, Trading Cards, tv series. Bookmark the permalink.